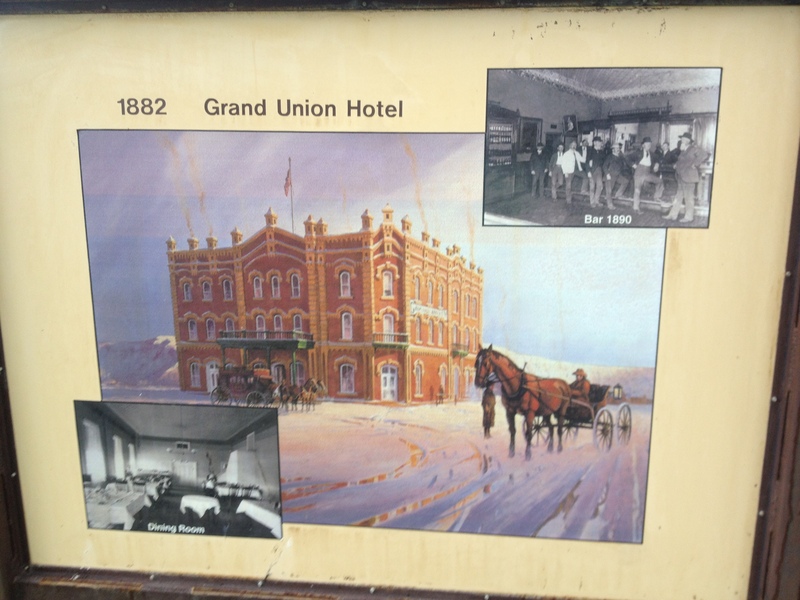 I arrived at Fort Benton the same day that I left Great Falls. The paddle only took a few hours from Carter Ferry. 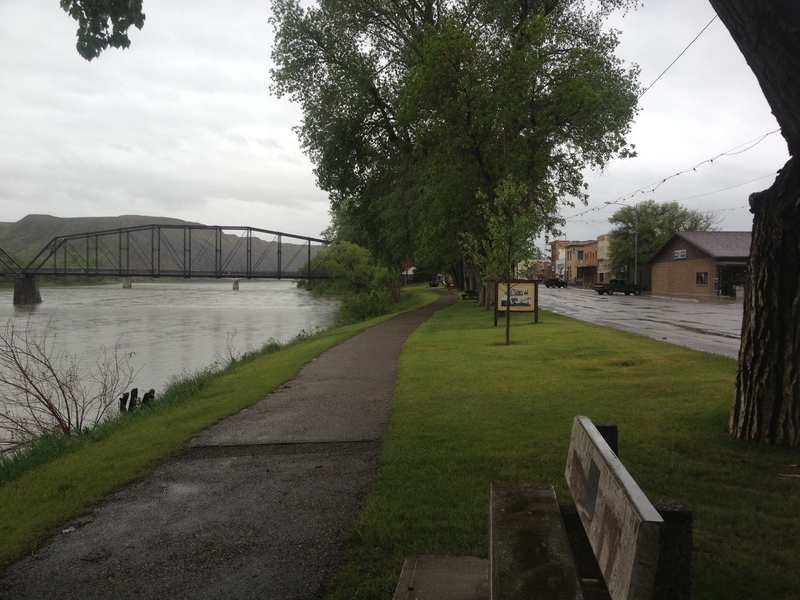 I knew rain was forecasted, so I planned on staying in Fort Benton for a least a couple of days, which I would have done anyway. This post is a photo story post. I hope you enjoy it. Carter Ferry is one of only six cable ferries in existence. 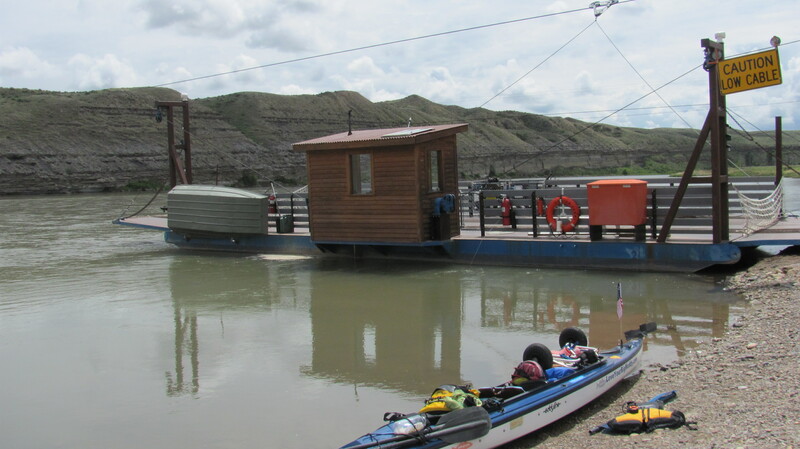 Another cable ferry is in Virgelle, between Fort Benton and Coal Banks Landing. There are also two others in the area, making four out of the six ferries that are functioning located here in northern Montana. 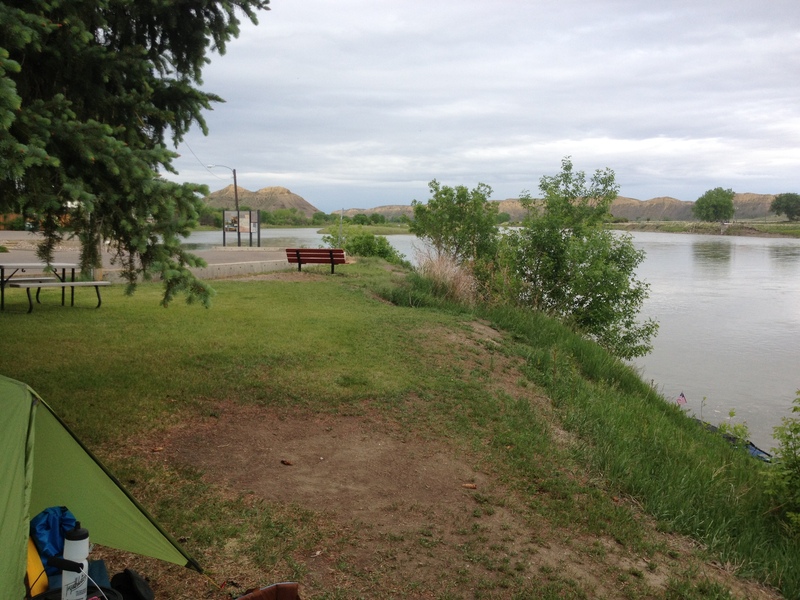 I opted to try and set up camp at the boat ramp in Fort Benton, rather than a mile upstream at the canoe camp. I was leary about it, but a police officer was sitting there in the parking lot, so I asked him and he said it would be fine. He said he and the night shift officer would keep an eye on me. Sweet! This is it, but the inside is cozy and dry. Well, except at 1:50 AM when the darn automatic sprinkler comes on for 40 or so minutes every night. Geez. The last night there I took off the tarp because the storm had passed, but I forgot about the sprinkler. My tent fly got soaked after staying dry through the whole storm. Kinda funny. 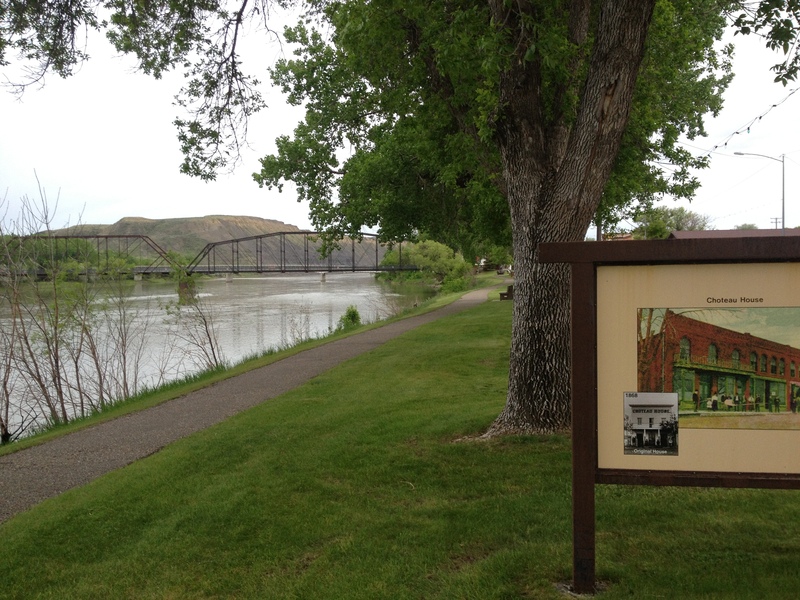 Fort Benton’s riverside walk is lined with historic information signs for a long ways. 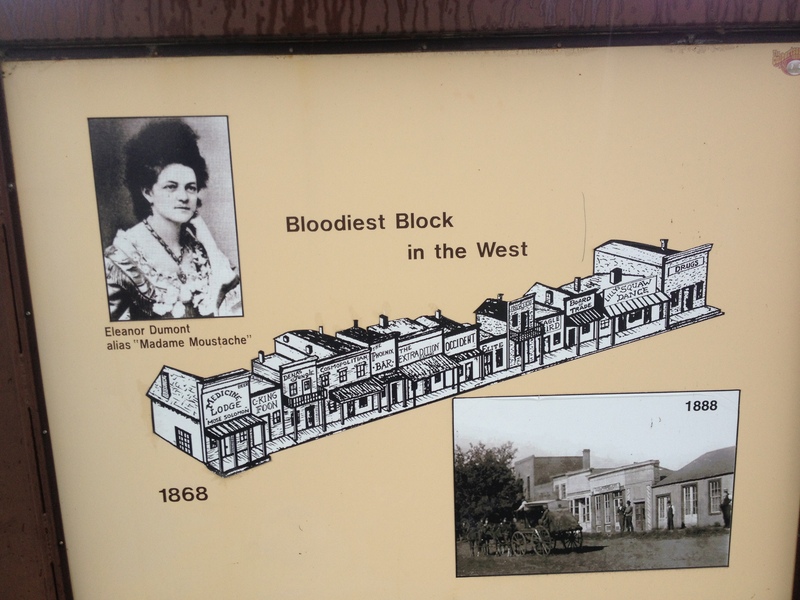 It is fun learning about the town’s history while walking along the river, which is, of course, where most of the town’s historic events took place. 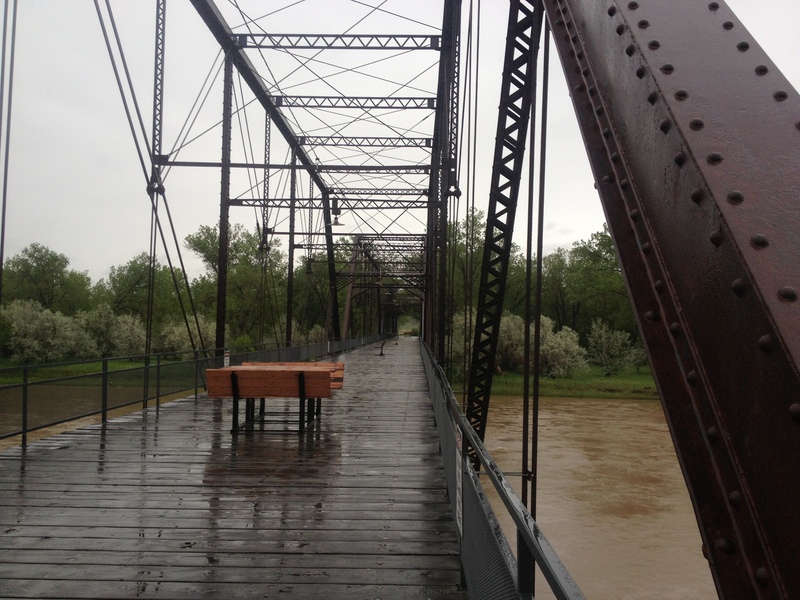 That is a walking bridge in the background and has benches and picnic tables on it. 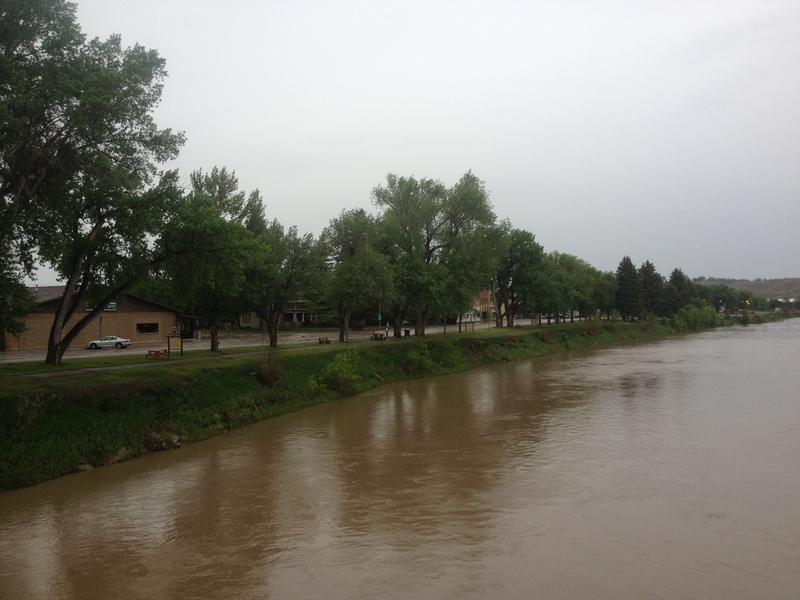 Here is a view of the riverfront levee from the walking bridge. 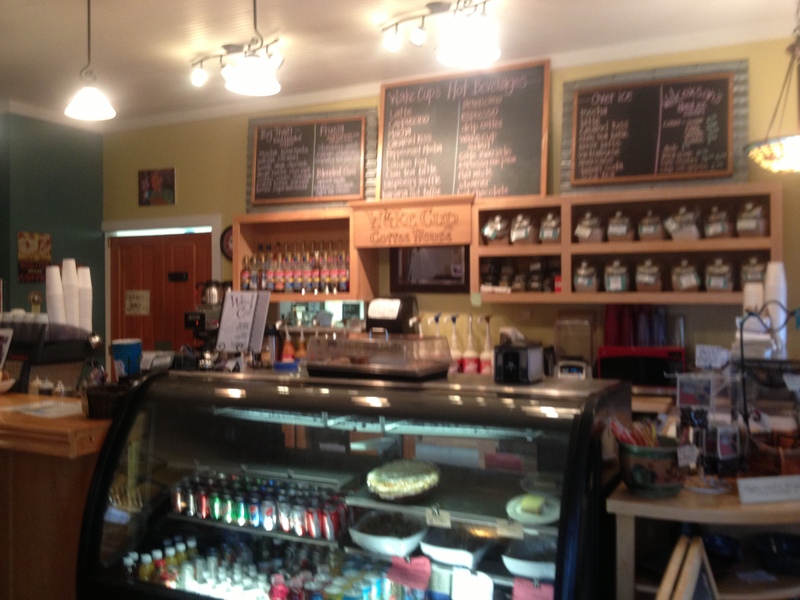 This sweet cafe was right across the street. The waitress was so nice, she let me stay there all day until closing at around 2:00. I didn’t stay there all day every day. Just the first day. The other days I left before closing, and I went to the library, too. It was a nice rainy day hang. 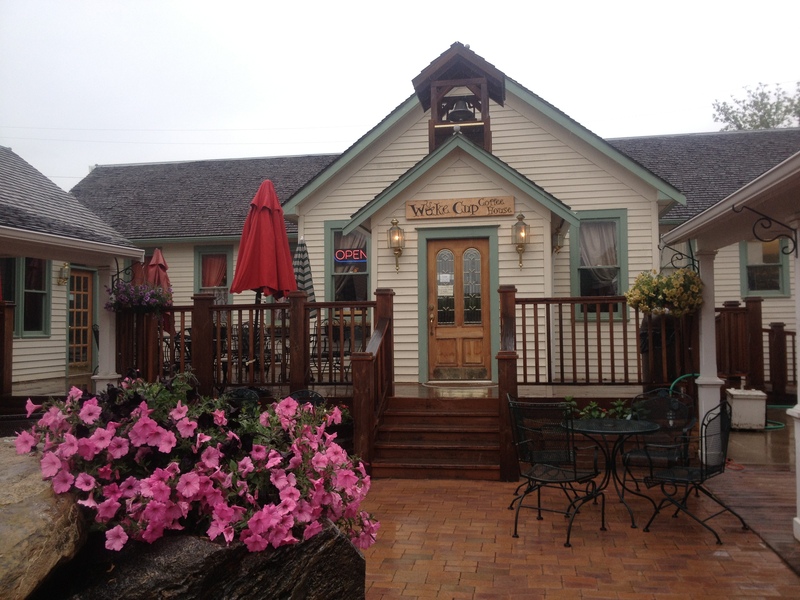 The coffee was delicious and so were the breakfasts and lunches. I had an omelette two mornings in a row. 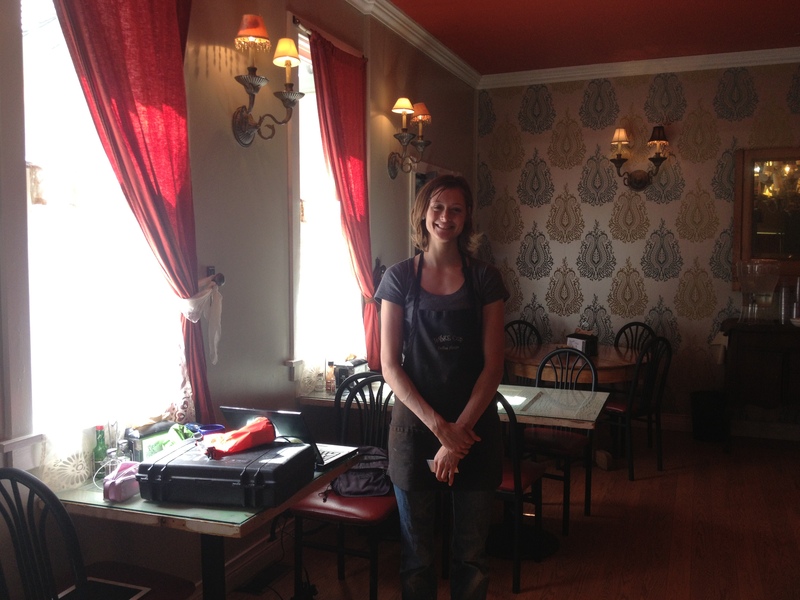 This is Nikki, my very sweet waitress at the Wake Cup. I wanted a photo of her, for that reason. Unfortunately, it wasn’t until I was leaving that I learned she was the ranger in the Breaks National Monument for three years previous. It would have been nice to chat, but she was usually very busy. 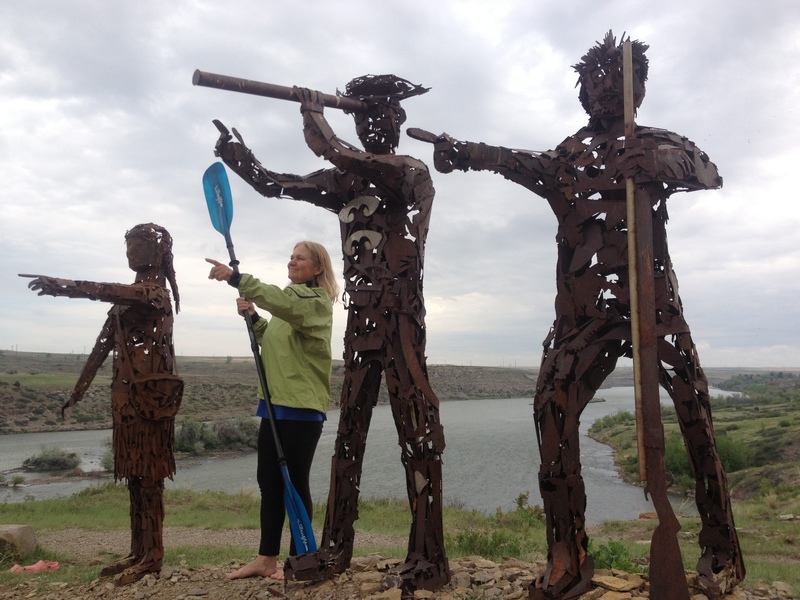 Very nice, though, and currently the volunteer coordinator for Friends of the Missouri River Breaks. 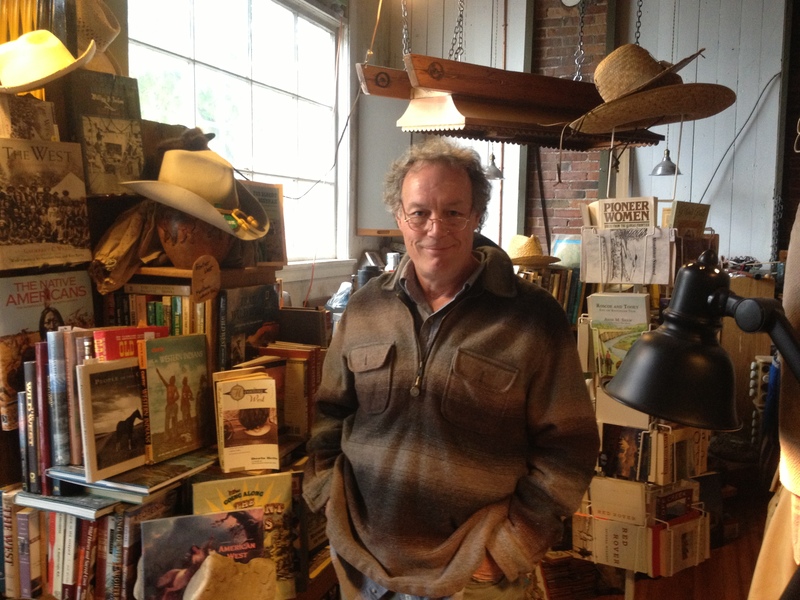 River Break was the coolest little bookstore with all kinds of interesting books and used gear, rocks and stuff. Tom is the owner of River Breaks. He gave me a great deal on three books. What an interesting and knowledgeable guy. 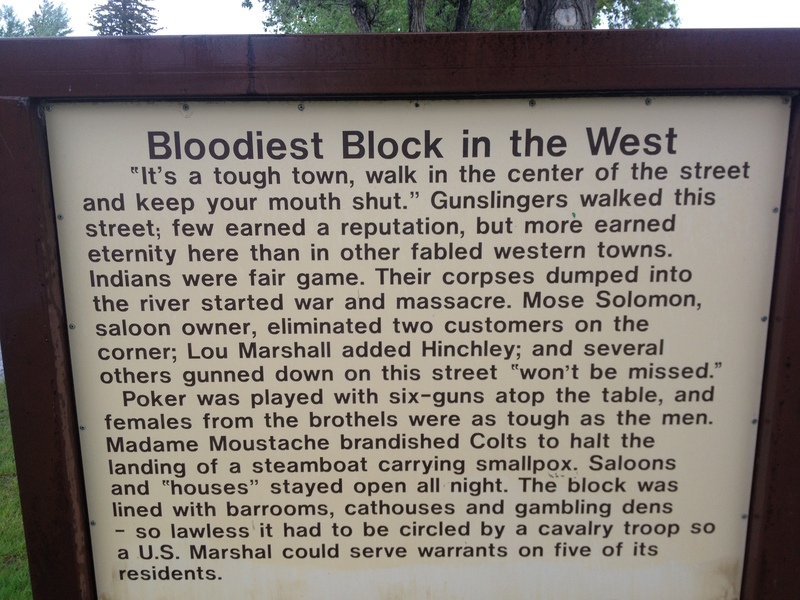 This is a must stop in Fort Benton. Please note, he does no have a hostel up and running, or showers, laundry and shuttle. These are part of his dream. Go for it, Tom! 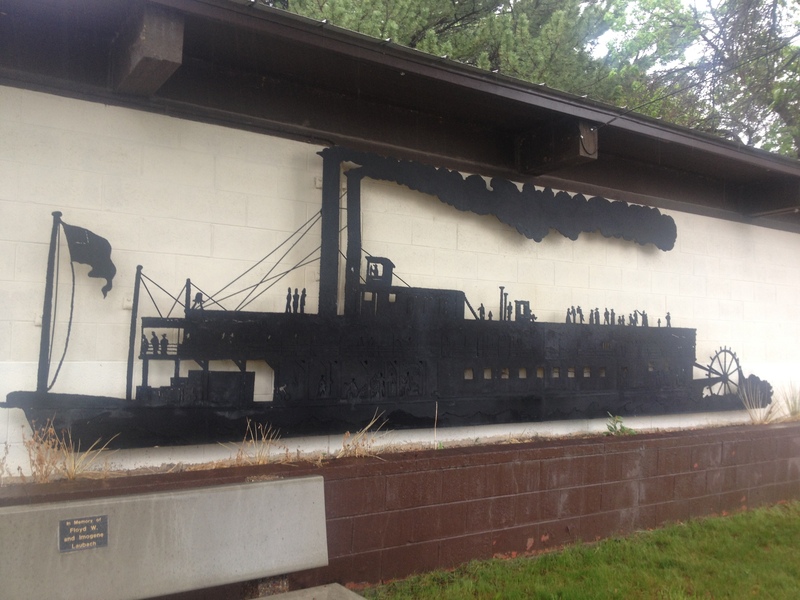 Side of the Upper Missouri River Museum building, located right next to my camp. 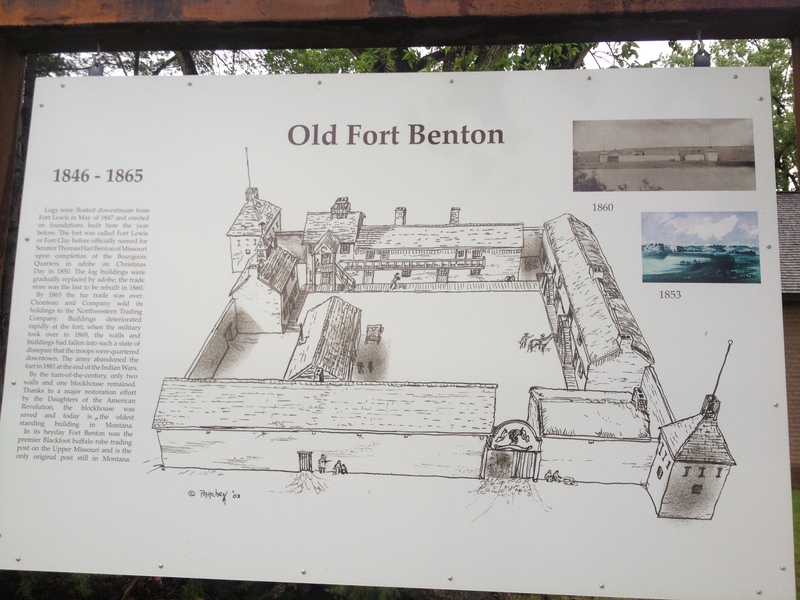 Fort Benton was also next door. The levee today with a view of the old bridge, which is now just for walking and sitting and contemplating. It rained and rained and rained. 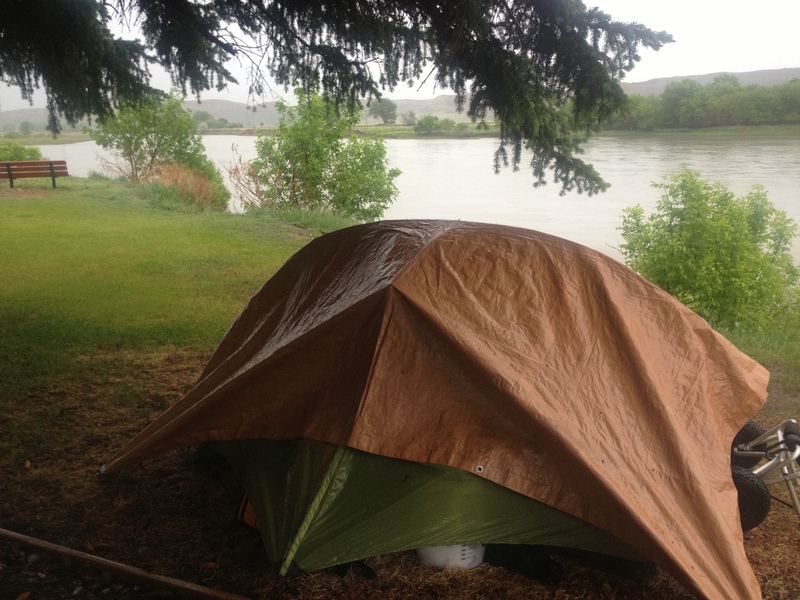 The rain stops eventually, and now it was time to move on down the river. 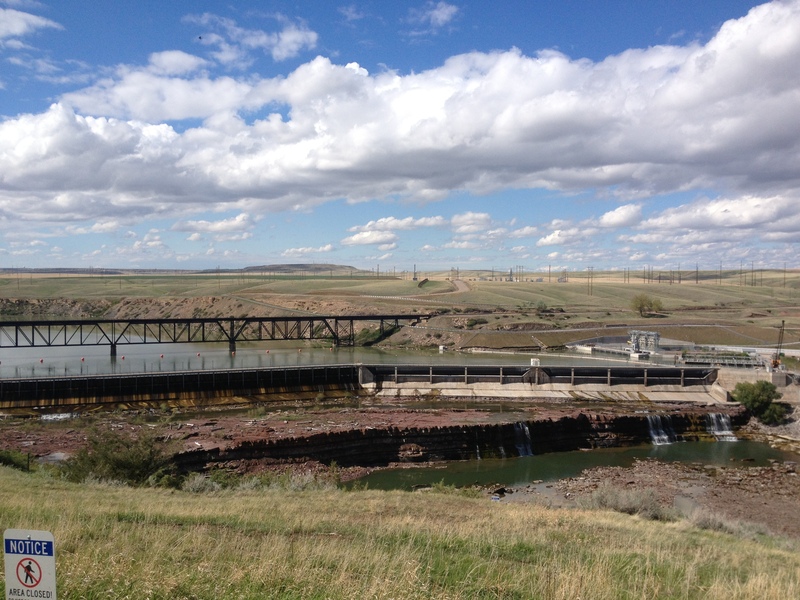 Fort Benton is a town that will warm your heart, and get you interested in the Missouri River and its connection to our country’s history and culture. 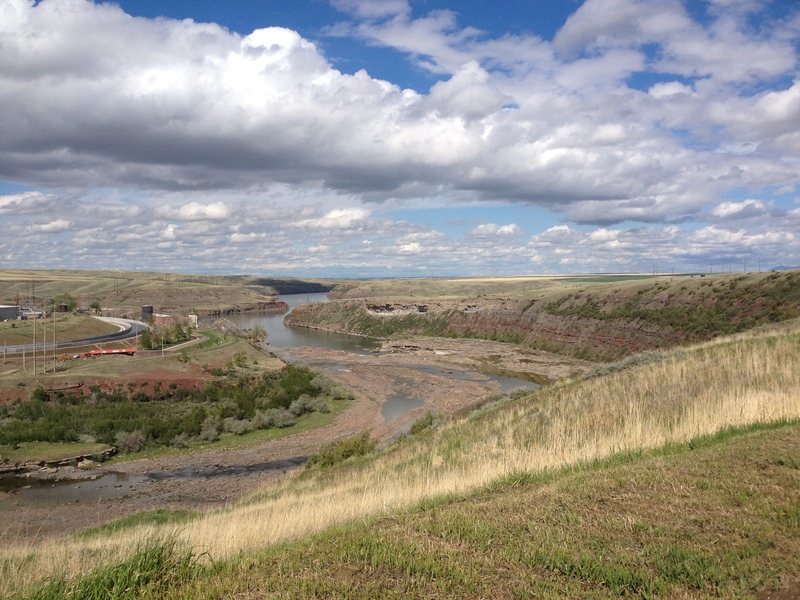 It began raining again on June 2, the afternoon of the day I arrived at Coal Banks Landing. 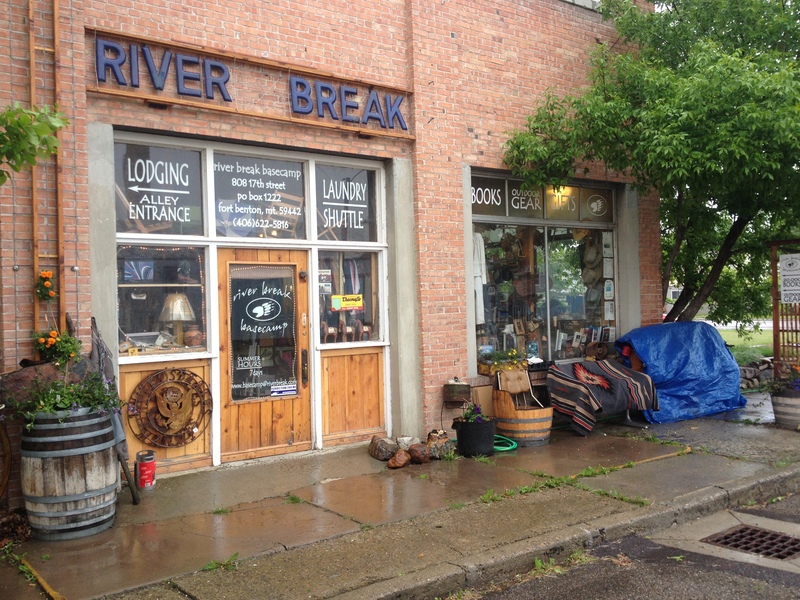 I have some interesting photos of the paddle down to Coal Banks, the paddlers laying over at Coal Banks, the proprietors of the Virgelle Mercantile Store, and my second visit to Fort Benton when I came with Dominique Liboiron, who came to visit me from Saskatchewan during this next rain delay before starting into the Breaks. Dominique paddled from Saskatchewan, Canada, to New Orleans last summer and winter, arriving just before Mardi Gras. 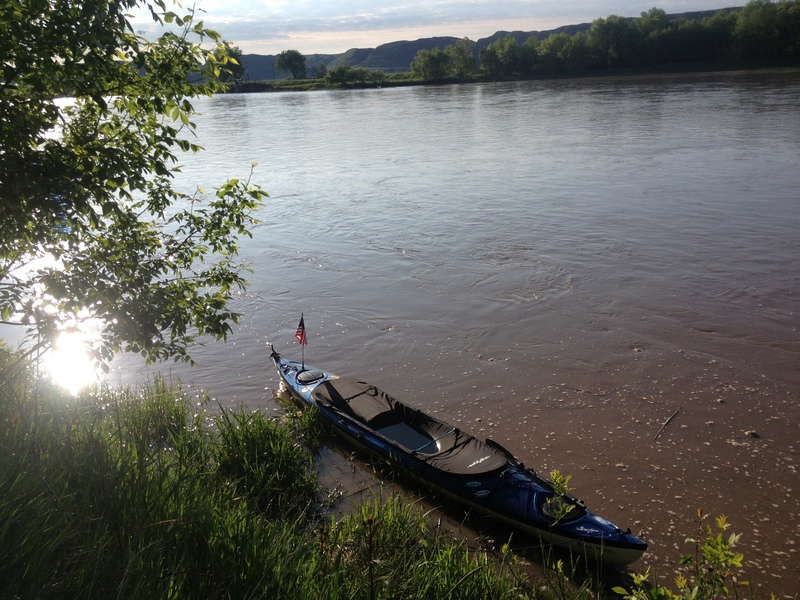 We instantly became friends when he stopped over at Cooper’s Landing, my river hangout in Columbia, Missouri. 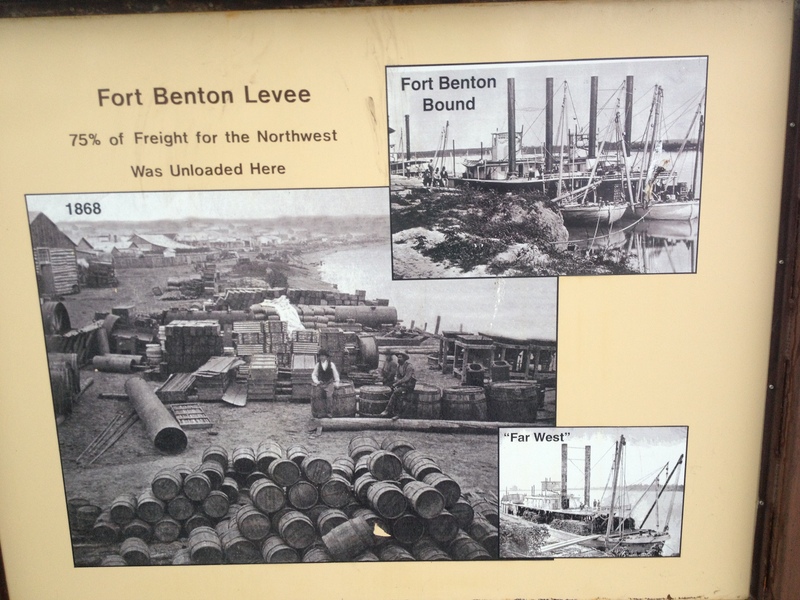 My next post will share with you our visit together and some additional interesting things we discovered in Fort Benton. Do what you love, and love what you do! Paddling into Great Falls! Monday, May 27. I absolutely LOVE this photo of John, Keely and Hazel, the dog. I kinda like all of them alot! When John, Sherri, and Bob came to paddle with me, John had offered me a place to stay and a ride around the dams. I phoned him shortly before I arrived and told him I would love to take him up on his offer. He said, “Great, I’ll be right there to pick you up.” Then, when I told him I could not get a clear visual in my mind about the Great Falls and what they look like, he drove straight over to the first two falls to take a look. This was a tremendous help. Plus, we saw some other really cool things, too, like Giant Spring and Great Horned Owl babies. 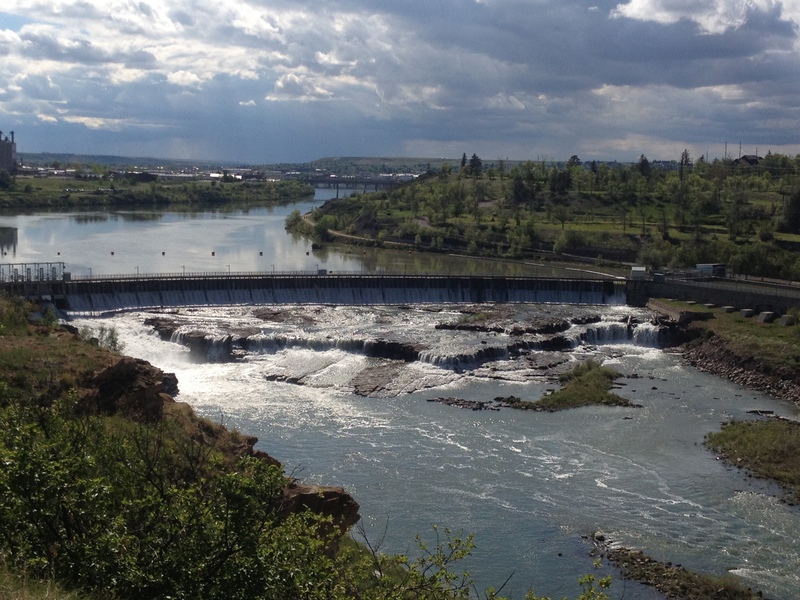 This is Black Eagle Falls, the uppermost falls of the five dams comprising the “Great Falls.” The city of Great Falls is in the background. This is the second from the top falls, Rainbow Falls. All of the water is diverted through the power house so no water runs through it except on weekends, when they let extra water out. Here is a view looking down stream from Rainbow Falls. 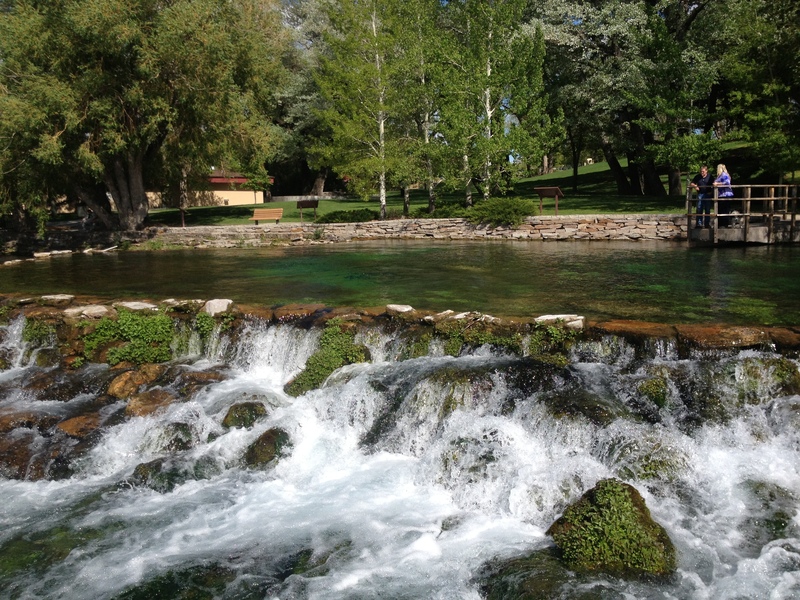 This is Giant Spring located within Giant Spring State Park between Black Eagle and Rainbow Falls. It is the source of the shortest river in the country, the Rogue River. It empties into the Missouri River after about 100 yards or so. Watercress growing in the spring. 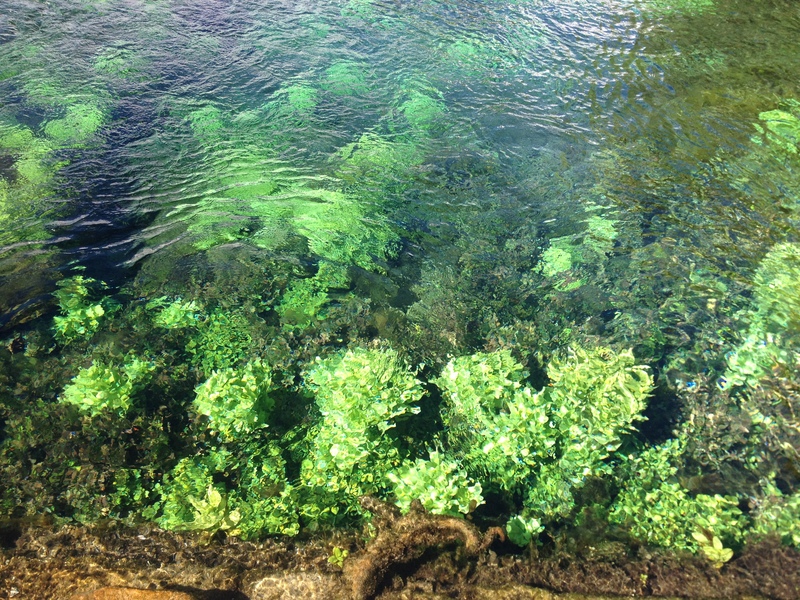 Look how clear that water is! 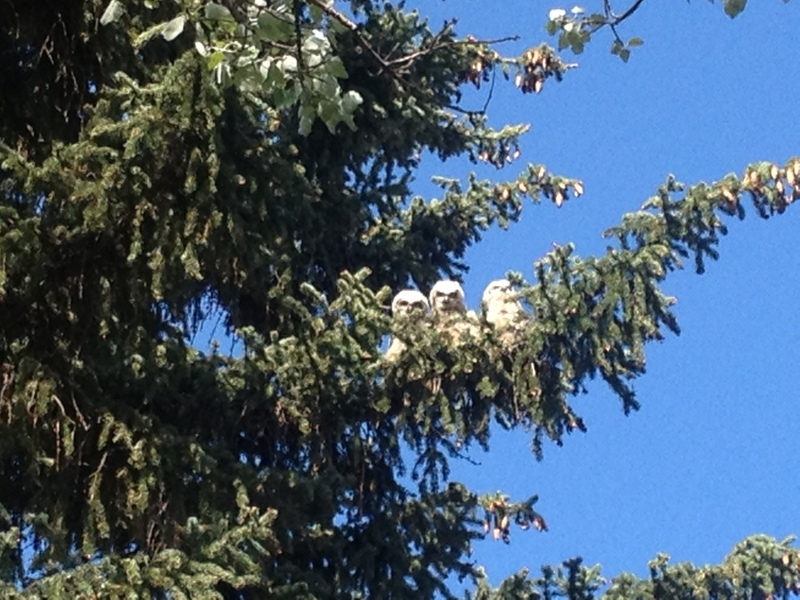 This is a nest with three Great Horned Owl babies. If you don’t know they are there, you probably won’t see them. John knew where they were and we were fortunate to get a good clear sighting, let alone an awesome photos! 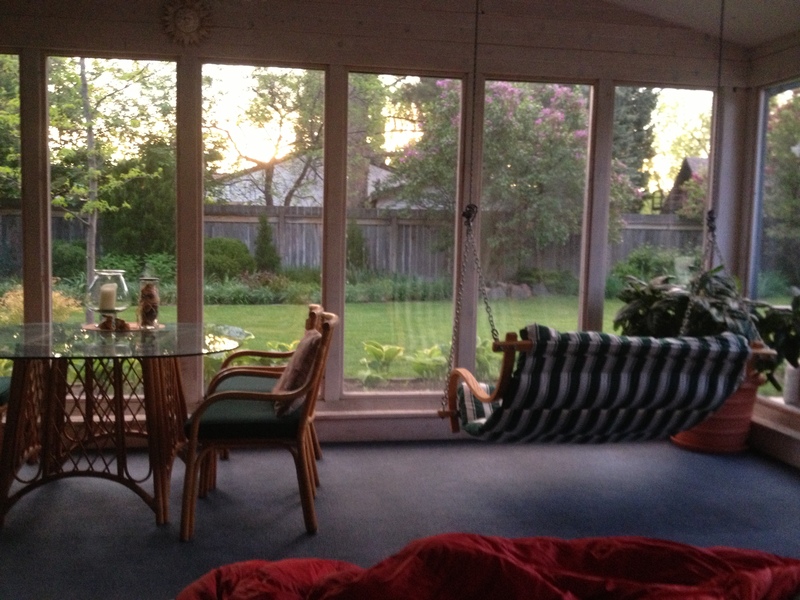 This is John and Keely’s back screened in porch which has a double bed. This was my bivy in Great Falls. Sweet, eh? We enjoyed a fun evening eating pizza (YUM!) and Bob came over and joined us. He, along with John, gave me a lot of tips on paddling, particularly how to power stroke. “Why do you hold your paddle with you hands so close together? You look like you are dog paddling.” I don’t know. I’m just holding it. Well, they showed me how to hold my elbows at 90 degrees before grabbing the paddle, and then how to use your whole body to stroke strong and efficiently. WOW! 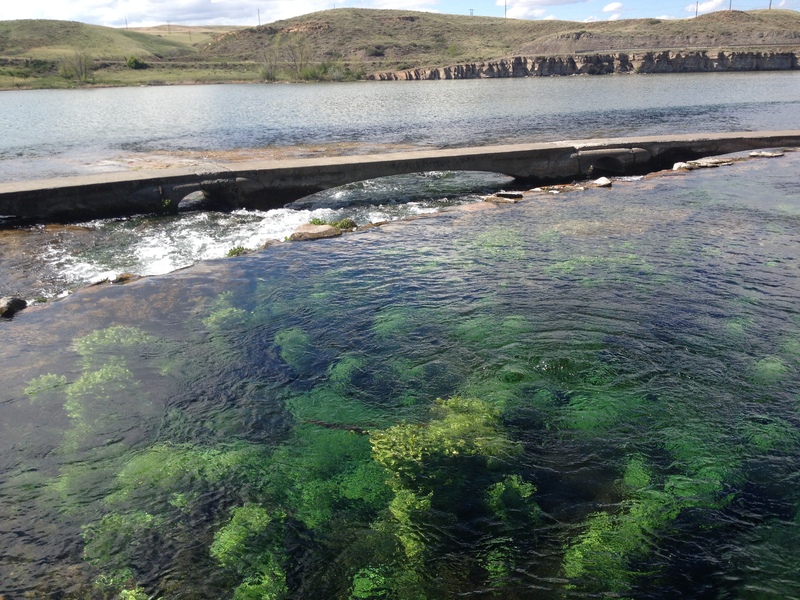 (This was incredibly useful for me on Fort Peck Lake, a couple weeks later.) Bob also showed me some stretches. I told them my back was having a bit of difficulty, and he explained that it was more likely my hamstrings from sitting in the kayak. His doctor told him the same thing. 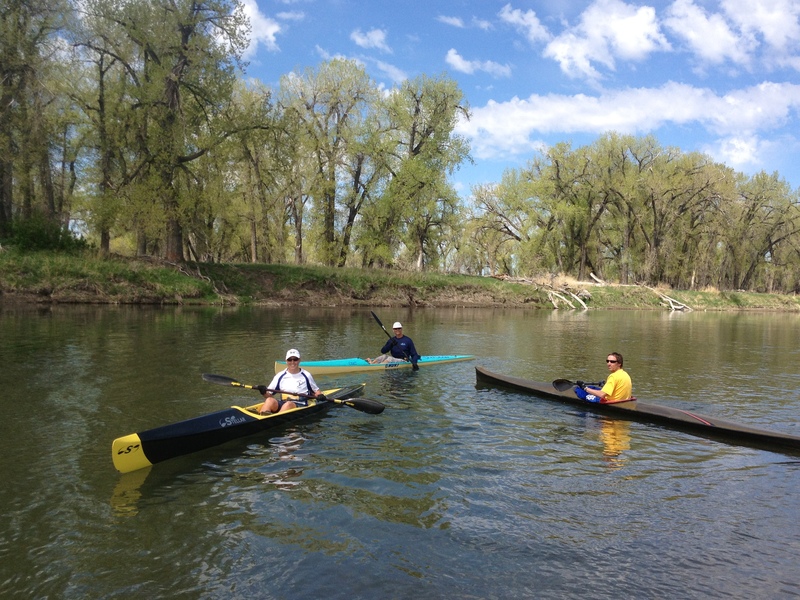 Here is a picture of Bob (right), and John and Sherri from when they came up and paddled with me a couple days previous. 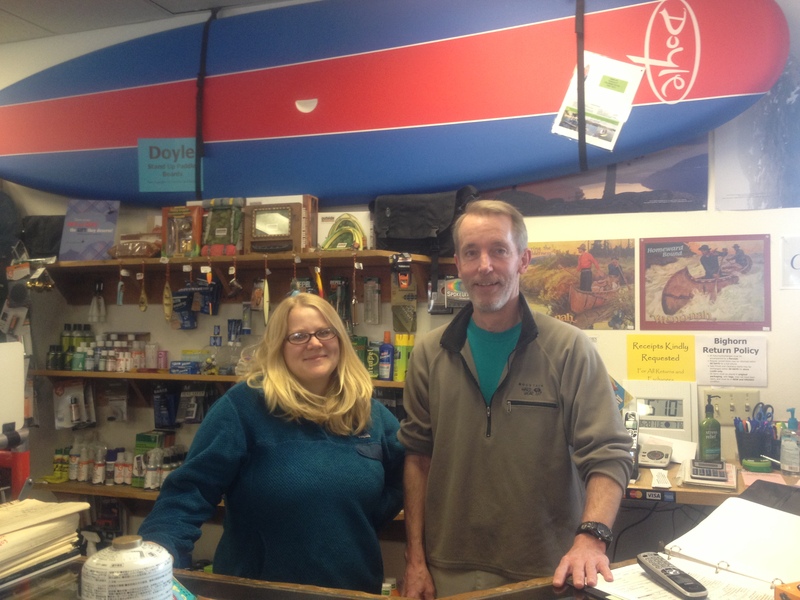 They are part of a kayaking group that organizes fun kayaking events and races. 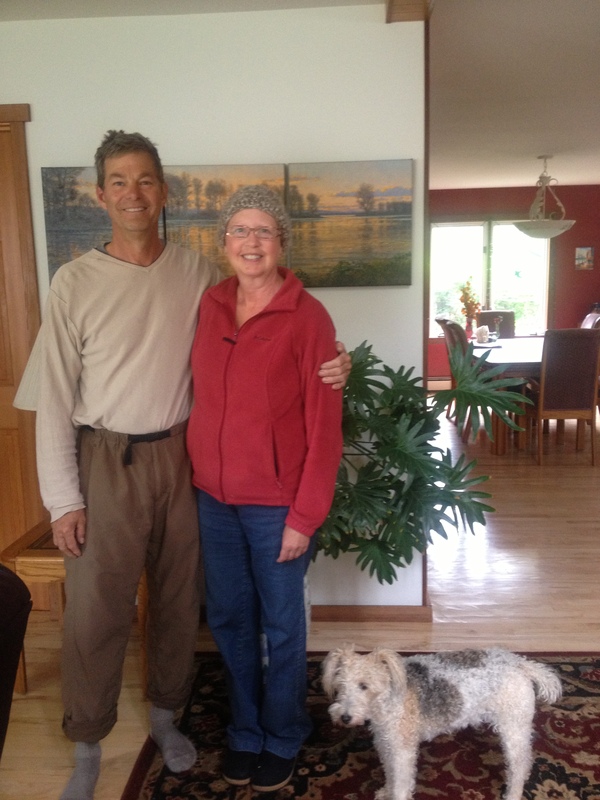 I was able to hang out at the house and update my blog while Keely and John went about their business. That was really nice, since blog posts take lots of time. 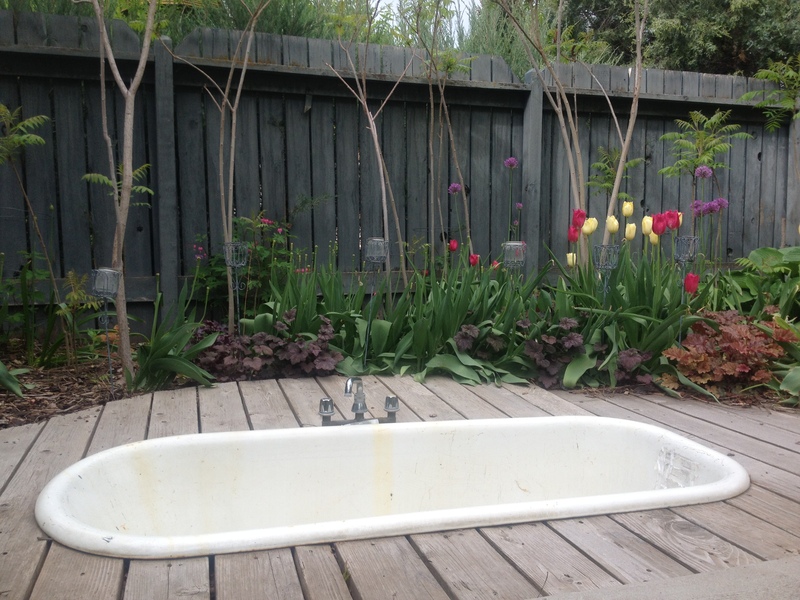 I couldn’t help but notice, and love, this backyard spa (chuckle). I love this. John and Keely’s hot tub in the back yard. How cool is that? During the afternoon, John took me to get some “must have” synthetic golfing gloves for paddling. We went to Meadow Lark Country Club where Michael very graciously gave me a pro deal on the gloves. They are great, both the Country Club and the gloves! John had so much great advice for me. 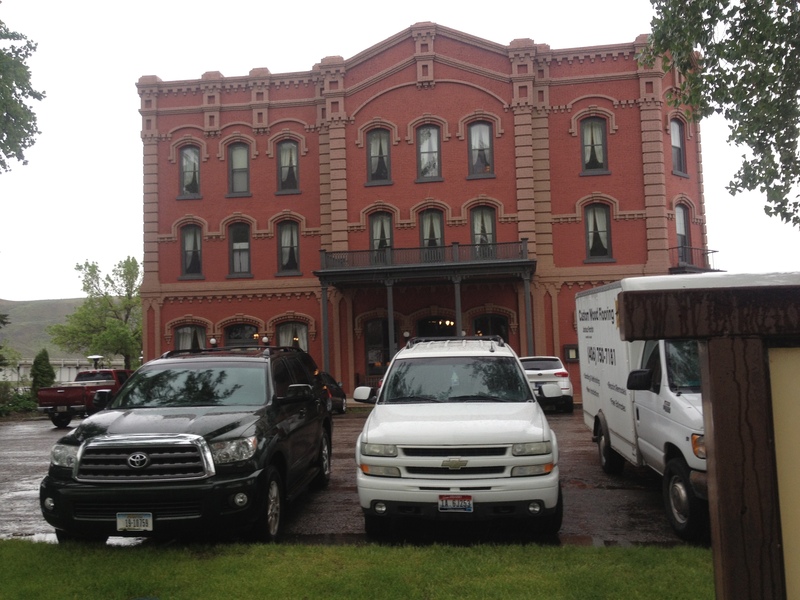 Then we went to his store, Bighorn Outdoor Specialists, that he owned for 38 years. The staff there were friendly and willing to offer a pro deal for the supplies I needed. If you are EVER in Great Falls, be sure to stop at this awesome sports store. The staff at Bighorn Outdoor Specialists. They gave me a sweet pro deal on supplies I needed, like a water filter, Cliff Bars, stove fuel and new sunglasses. Thanks, guys! I headed to the put in the next day. 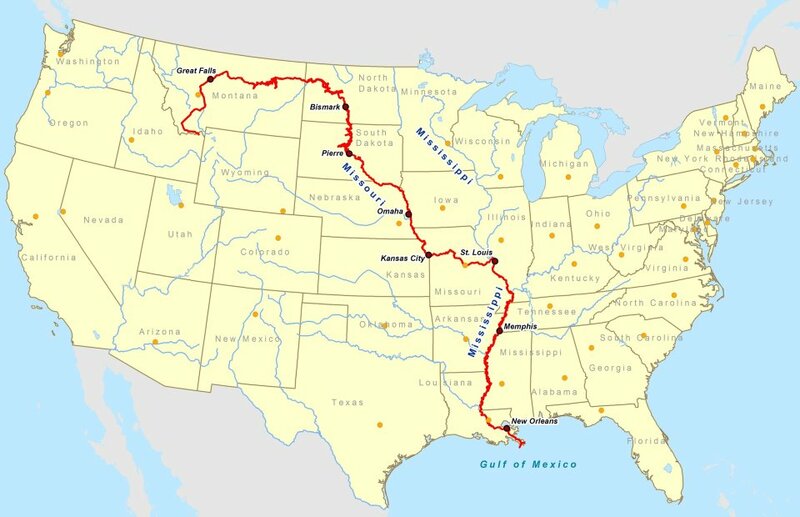 It was quite a drive, and John was so nice to take care of me. 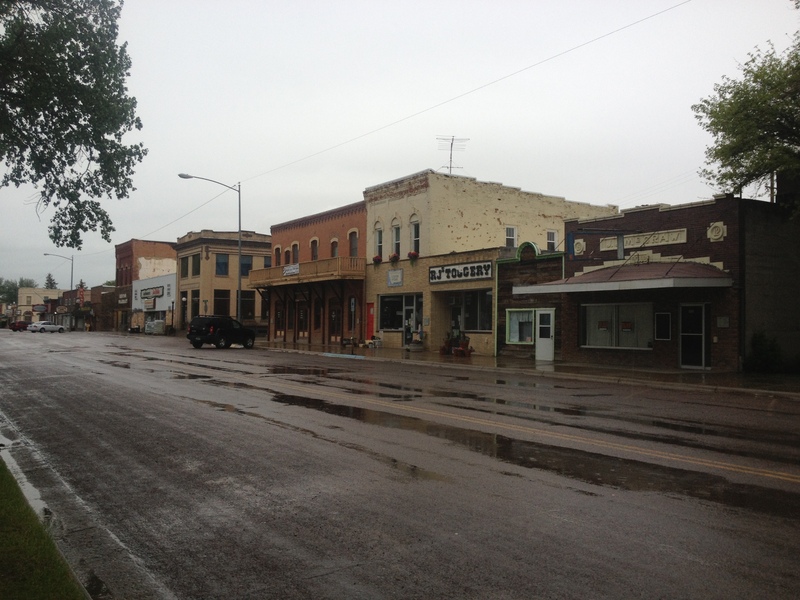 Unfortunately, the road became so muddy we had to turn back and go all the way around town to Carter Ferry. This is often the case, but we thought we could make it. The area had seen a lot of rain recently. 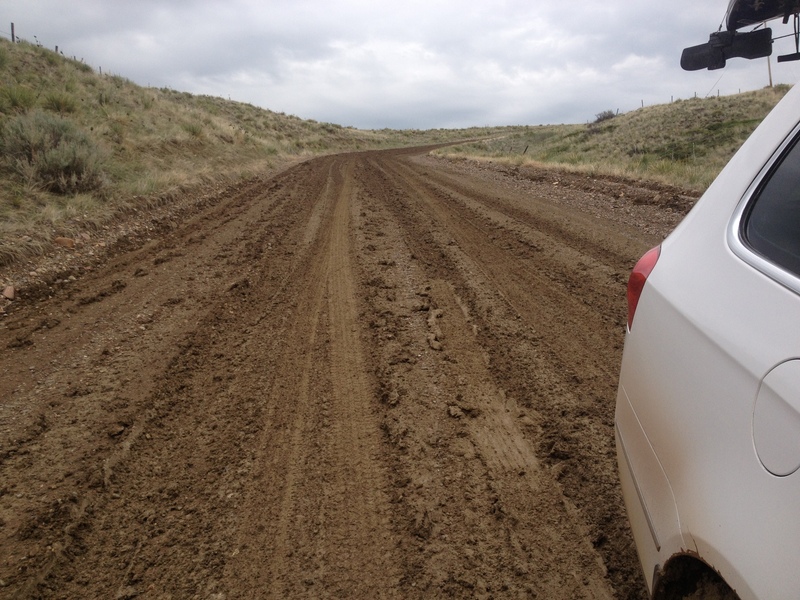 The mud on the road to Widow Coulee prevented us from getting to this put in. 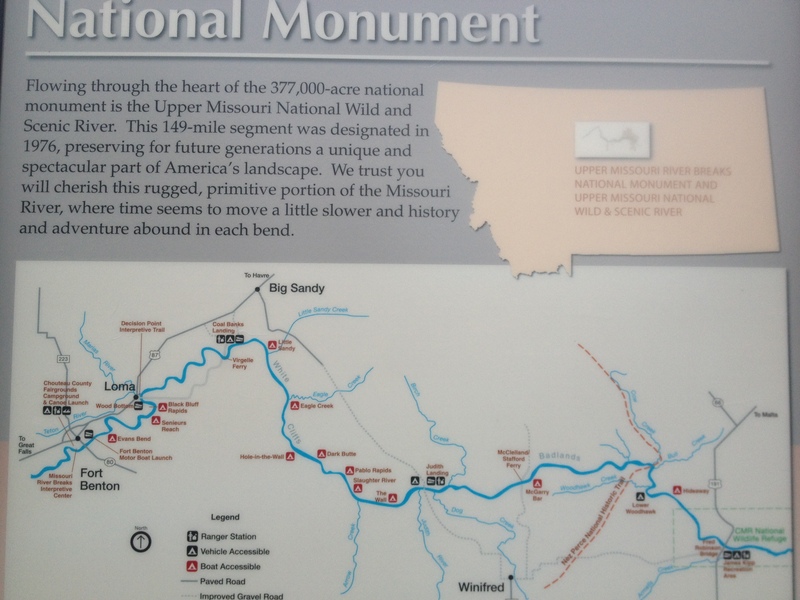 We had to drive about 45 minutes back to Great Falls, and down the other side of the river to Carter Ferry. 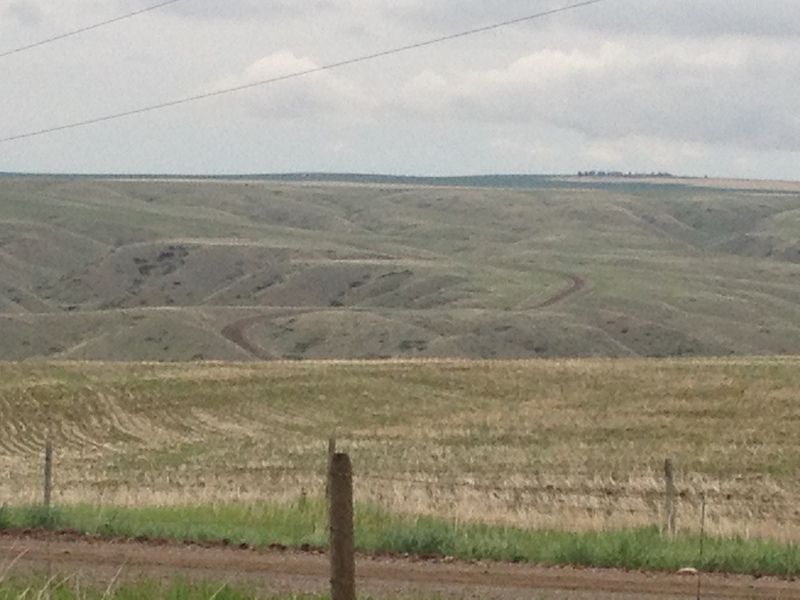 This wasn’t even the steep part as you drive into the river canyon. We would have never made it. 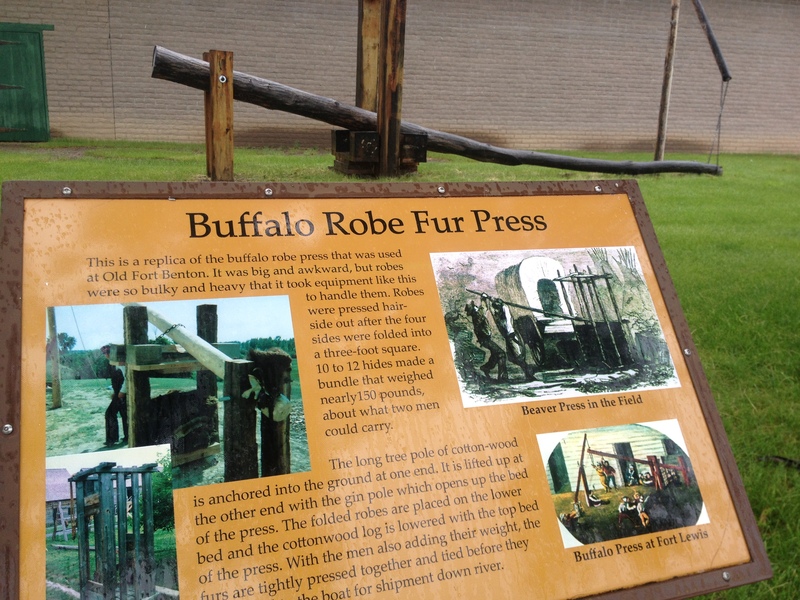 Before we got to far, though, John stopped and let me photograph these historical information signs telling about the Corps of Discovery’s portage around the Great Falls. 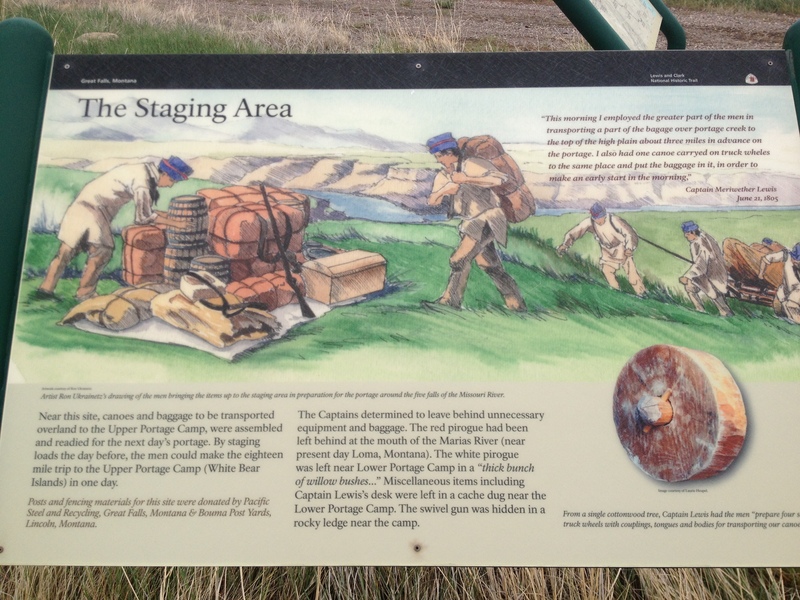 You can find a series of educational signs way out in the middle of nowhere, but right in the vicinity that the Corps of Discovery staged their portage. No easy feat it was. 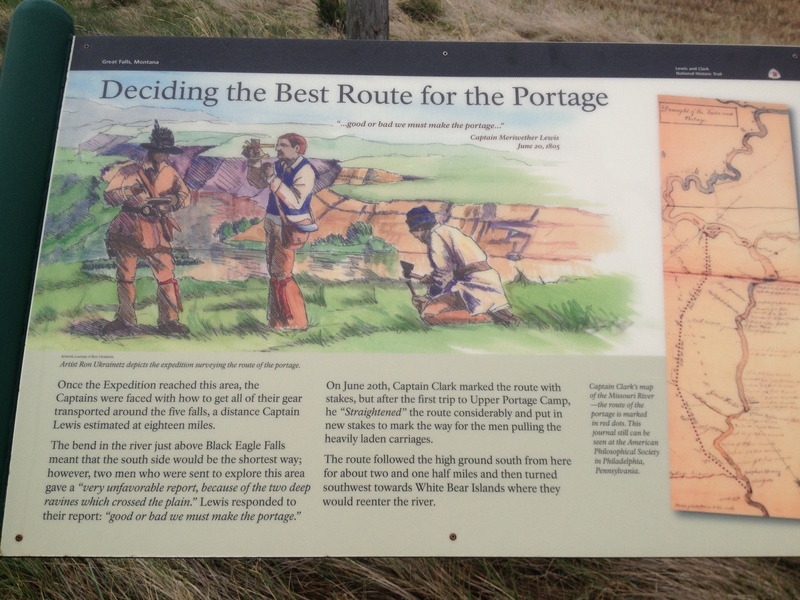 Another historical information sign regarding the Corps of Discovery portage around the falls. Looking out over the area where the Corps of Discovery conducted their portage. That is the river valley. John thought this would make a classic photo. I think he was right. Pretty funny. Problem here is, I’m going the other way!